Description: Pink. The text: XV OLYMPIA HELSINKI 1952. Date: 30 VII 1952. Section: E 51. Rivi [row] 6 Paikka [seat] 2. Picture: handball players. Other information: Ticket for the demonstration match in handball between Sweden and Denmark in the Olympic Stadium on 30 July. Outdoor handball was a demonstration sport at the Helsinki Olympic Games. Sweden won the match by 19-11. 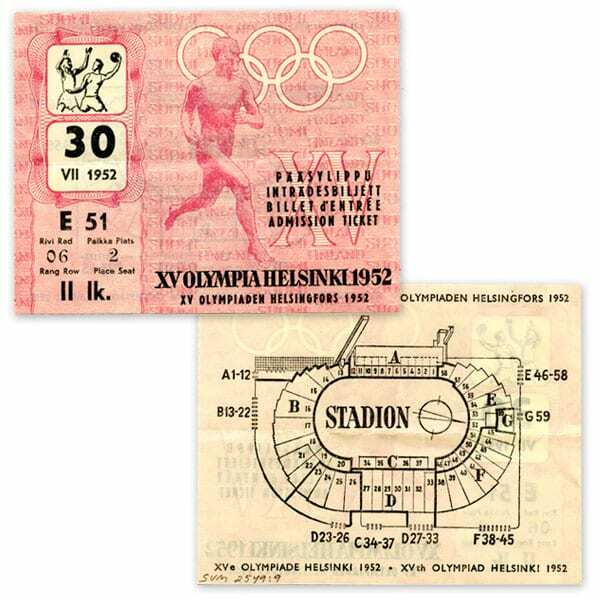 A total of 1,376,512 admission tickets were sold for the Helsinki Olympic Games.